U.S. Route 11 (US 11) is a signed north–south (while physically generally northeast-southwest) highway United States highway extending 1,645 miles (2,647 km) across the eastern United States. The southern terminus of the route is at U.S. Route 90 in the Bayou Sauvage National Wildlife Refuge in eastern New Orleans, Louisiana. The northern terminus is at the Rouses Point - Lacolle 223 Border Crossing in Rouses Point, New York. The route continues across the border into Canada as Quebec Route 223. US 11, created in 1926, largely follows the route of the original plan. Until 1929, US 11 ended just south of Picayune, Mississippi at the Pearl River border with Louisiana. It was extended through Louisiana after that. The Maestri Bridge, which carries US 11 across Lake Ponchartrain, served as the only route to New Orleans from the east for six weeks after Hurricane Katrina due to its sturdy construction. The storm virtually destroyed the Twin Span Bridge on I-10 and damaged the Fort Pike Bridge on US 90. Interstate 81, constructed in the 1960s, parallels the route of US 11 in many areas. Beyond I-81's southern terminus, other interstates run along corridors paralleling US 11, specifically I-59, which is joined to I-81 by I-40, I-75, and I-24. US 11 spans 31.2 miles (50.2 km) within the state of Louisiana. Its southern terminus is located in Eastern New Orleans at a junction with US 90 (Chef Menteur Highway). The route begins as a two-lane highway that travels northward through a remote stretch of marshland within both the Bayou Sauvage National Wildlife Refuge and the New Orleans city limits. After crossing over I-10 at exit 254, US 11 proceeds across Lake Pontchartrain on the Maestri Bridge, a 4.8-mile-long (7.7 km) span dating from 1928 that parallels the I-10 Twin Span Bridge. Midway across the lake, US 11 enters unincorporated St. Tammany Parish. Upon reaching the north shore, US 11 follows Pontchartrain Drive into the city of Slidell, where it becomes a busy four-lane commercial corridor. After a brief concurrency with Louisiana Highway 433 (LA 433), US 11 turns onto Front Street and travels alongside the Norfolk Southern Railway (NS) line through Slidell's historic district. During this stretch, the route intersects both US 190 Bus. (Fremaux Avenue) and mainline US 190 (Gause Boulevard), both four-lane thoroughfares connecting with nearby I-10. Returning to two-lane capacity, US 11 crosses to the west side of the NSRW line on a narrow overpass built in 1937. At the north end of the city, US 11 intersects I-12 at exit 83, which is located just west of a major interchange with I-10 and I-59. A few miles later, US 11 enters the town of Pearl River and intersects LA 41 (Watts Road). Here, the route turns southeast onto Concord Boulevard and proceeds a short distance to exit 3 on I-59. US 11 turns north onto I-59 and utilizes the four-lane interstate alignment for the remainder of its distance in Louisiana. Following a second interchange serving the small town, I-59 and US 11 cross the West Pearl River into the dense Honey Island Swamp. Along this stretch is an exit connecting to Old US 11, a remnant of the pre-interstate alignment that provides access to the Pearl River Wildlife Management Area. US 11 crosses into the state of Mississippi with I-59 on a bridge spanning the main branch of the Pearl River just south of Nicholson. U.S. Route 11 enters the state of Mississippi along Interstate 59, passing through several directions of trees. After a short distance, Route 11 and Interstate 59 interchange at Exit 1 with Mississippi Highway 607, where 607 ends and U.S. Route 11 takes over its northeastern alignment away from Interstate 59. Route 11 generally parallels I-59 across Mississippi, serving as a local business route and following city streets through communities such as Hattiesburg, Laurel, and Meridian. It leaves the state east of Meridian concurrent with U.S. Route 80, entering the state of Alabama. 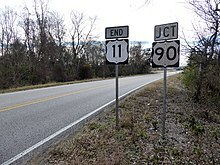 U.S. Route 11 and U.S. Route 80 split three miles (5 km) into Alabama near Cuba, with U.S. 80 following an eastward track toward Demopolis. US 11, in contrast, continues to parallel the I-20/I-59 freeway through Livingston to Eutaw, where US 11 joins U.S. Route 43. The overlapping routes proceed northeast to Tuscaloosa, where US 43 splits from US 11 and heads north. US 11, however, continues along the I-20/I-59 corridor to Birmingham. US 11 overlaps I-20/59 for approximately 12 miles (19 km) between Woodstock and Bessemer. From Bessemer into Birmingham, the route is locally known as the "Bessemer Superhighway." US 11 is co-signed with Alabama State Route 5 between Woodstock and Birmingham. US 11 through the western side of Birmingham is known as the Bessemer Superhighway and 3rd Avenue West. It passes near the Alabama State Fairgrounds, Rickwood Field (one of the oldest baseball stadiums in America) and Legion Field (known for hosting football games). On the east side of Birmingham, US 11 is known locally as 1st Avenue North and as Roebuck Parkway. West of downtown Birmingham, US 11 intersects U.S. Route 78. US 78 turns east onto US 11, forming an overlap as the roadway enters the heart of the city. In the midst of the city center, US 78 breaks from US 11, progressing south of US 11 as the two routes exit the city. East of downtown, I-20 splits from I-59, with US 11 following I-59 to the northeast. US 11 passes through Gadsden and Fort Payne before crossing into Georgia ten miles (16 km) northeast of Hammondville. Throughout Alabama, US 11 is paired with unsigned Alabama State Route 7. Until 1955, US 11 was routed to Ashville and Gadsden following the current routes of AL 23 and US 411, and followed Third Street and went west on Forrest Avenue in downtown Gadsden. It was relocated to its present route to Attalla, with the original route designated as an alternate route until 1963. The routes that corresponds to US 11's route in Alabama includes the Bear Meat Cabin Road (Huntsville Road), the Rome and Tuscaloosa Road (also called "Georgia Road") from Birmingham, and the Chattanooga Road (also called Alabama Road) from Attalla. After entering the state from Alabama, US 11 and State Route 58 (SR 58) travel northeast, parallel to Interstate 59 (I-59), through the valley between Sand Mountain and Lookout Mountain. The routes travel through the county seat of Dade County, Trenton, where they are briefly concurrent with SR 136. In the community of Wildwood, US 11 and SR 58 intersect the eastern terminus of SR 299 before continuing north into Tennessee. US 11 and SR 58 see an Average Annual Daily Traffic (AADT) of 5,000 vehicles or more north of Trenton. However, most of the route's through traffic has been diverted to Interstate 59, which closely parallels the route not only in Georgia, but also in Alabama and Mississippi. US 11 enters Tennessee west of Chattanooga. The route, concurrent with SR 38 from the state line north, runs parallel to Interstate 24 for three miles (5 km) to an intersection with Cummings Highway (US 41/US 64/US 72/SR 2). While SR 38 terminates here, US 11 follows the highway east into downtown Chattanooga. At the intersection of Broad Street and East 23rd Street, US 11 and US 64 separate from US 41 and US 72 and follow East 23rd east through downtown. The routes briefly overlap with US 41, here concurrent to US 76, on Dodds Avenue before resuming an easterly progression on Brainerd Road thereafter called Lee Highway. The road is also called Lee Highway in Southwestern Virginia. East of downtown, I-24 terminates while Interstate 75 continues east along the I-24 right-of-way. US 11 and US 64 continue to the northeast, paralleling I-75 to Cleveland. In downtown Cleveland, US 64 separates from US 11, following US 74 east out of the city. US 11 remains close to I-75 as it heads north, passing through Athens, Sweetwater, Loudon, and Lenoir City before entering Farragut. On the western edge of town, US 11 merges with US 70 at Dixie Lee Junction to form Kingston Pike. The routes remain joined for just over 20 miles (32 km) as they pass through Farragut and West Knoxville before diverging again in downtown Knoxville. In eastern Knoxville, US 11 splits into U.S. Route 11W and U.S. Route 11E, with US 70 following US 11E. Traversing 120.9 miles (194.6 km) from Knoxville, Tennessee to Bristol, Virginia, US 11E connects the cities and towns of New Market, Jefferson City, Morristown, Greeneville, Tusculum, Jonesborough, Johnson City, Bluff City and Bristol, all in Tennessee. After crossing into Virginia, it reconnects with US 11W. Traversing 111.2 miles (179.0 km) from Knoxville, Tennessee to Bristol, Virginia, US 11W connects the cities and towns of Blaine, Rutledge, Bean Station, Rogersville, Surgoinsville, Church Hill, Mount Carmel and Kingsport, all in Tennessee. After crossing into Virginia, it reconnects with US 11E. US 11W and US 11E rejoin as US 11 in Bristol less than a mile north of the Tennessee-Virginia state line. As Lee Highway, US 11 proceeds northeastward through Abingdon, Wytheville and Radford. In this area, Interstate 81 was constructed parallel to US 11. At Christiansburg, US 11 joins US 460 and the two routes overlap for 28 miles (45 km) to Salem, where the two highways split. 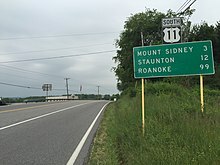 US 11 winds through Roanoke on several roads, sometimes opposite the signed direction. Part of the Carolina Road, a colonial trail, follows the roadbed of Route 11, also known as "the Lee Highway", through Virginia. Near Cloverdale, Virginia is the historical marker: "This is the old road from Pennsylvania to the Yadkin Valley, over which in early times settlers passed going south. On it were the Black Horse Tavern and the Tinker Creek Presbyterian Church." From Roanoke, the highway continues through Buchanan, Lexington, Staunton, Harrisonburg and Winchester in the Shenandoah Valley. (Between Buchanan and Lexington, US 11 passes over the famed Natural Bridge). Interstate 81 was constructed parallel to US 11 through many of these cities, although it generally bypassed the smaller towns. US 11 enters West Virginia about 10 miles (16 km) northeast of Winchester. Through the Valley of Virginia, Route 11 follows much of the former Valley Pike, a former colonial trace and important roadway during the Civil War. US 11 enters West Virginia less than 200 yards (180 m) southeast of I-81. US 11 heads northeast for about 35 miles (56 km) through Berkeley County, passing through Inwood, Martinsburg, and Falling Waters before crossing the Potomac River into Maryland. The road is known as Winchester Avenue south of Martinsburg, and as Williamsport Pike north of the city. In Maryland, US 11 passes over the Potomac River into Williamsport and through Hagerstown in Washington County before crossing the Mason–Dixon line into Pennsylvania. Interstate 81 was constructed along much the same route in the 1960s. US 11 and I-81 enter Pennsylvania south of Greencastle. Known as the Molly Pitcher highway, US 11 follows I-81 northeast through the Cumberland Valley, running parallel to each other as they pass through Chambersburg, Shippensburg, and Carlisle. Northeast of Carlisle in Middlesex, US 11 interchanges with the Pennsylvania Turnpike (Interstate 76) and I-81 in succession. US 11, now to the south of I-81, continues eastward into the western suburbs of Harrisburg as the Carlisle Pike. In Camp Hill, a close suburb of Harrisburg, US 11 stops paralleling I-81 and joins U.S. Route 15 northward through the western suburbs of Harrisburg. As the road exits the Harrisburg area, US 11 and US 15 begin to parallel the Susquehanna River as both head northward. The two routes remain overlapped to an intersection in Shamokin Dam, where US 15 branches off to the northwest, following the path of the Susquehanna's West Branch northward. US 11, in contrast, continues to parallel the main Susquehanna River, passing through municipalities such as Danville, Bloomsburg, and Berwick prior to reaching Wilkes-Barre. In Wilkes-Barre, US 11 breaks from the Susquehanna and begins to run parallel to I-81 once more. From Wilkes-Barre, the highway goes through nearby Scranton, becoming the North Scranton Expressway north of downtown. In Clarks Summit, just north of Scranton, US 11 intersects U.S. Route 6. US 6 joins US 11 westward to Factoryville, where US 11 separates from US 6 and resumes its northerly trek through Susquehanna County to the New York-Pennsylvania border. US 11 proceeds northwestward through New York from the Pennsylvania border to Binghamton. US 11 and I-81 continue to parallel each other as they head north through Cortland and Syracuse. The route continues northward to Watertown. US 11 heads northeast from Watertown, passing along the northern edge of the Fort Drum Military Reservation and traversing a number of towns and villages, including Canton and Potsdam. US 11 passes north of Adirondack Park passing through Malone. At Rouses Point, US 11 joins New York State Route 9B and heads north to the Rouses Point - Lacolle 223 Border Crossing, becoming QC 223. I‑59 in Pearl River. The highways travel concurrently to Nicholson, Mississippi. I‑20 / I‑59 / US 80 in Meridian. I-20/I-59/US 11 travel concurrently through the city. US 11/US 80 travel concurrently to Cuba, Alabama. US 43 in Eutaw. The highways travel concurrently to Tuscaloosa. I‑359 / US 43 in Tuscaloosa. I-359/US 11 travel concurrently through the city. I‑20 / I‑59 south of Lake View. The highways travel concurrently to Bessemer. US 78 in Birmingham. The highways travel concurrently through the city. US 278 / US 431 in Attalla. The highways travel concurrently through the city. US 41 / US 64 / US 72 in Chattanooga. US 11/US 41/US 72 travel concurrently through the city. US 11/US 64 travel concurrently to Cleveland. US 41 / US 76 in Chattanooga. The highways travel concurrently through the city. I‑75 in Chattanooga. The highways travel concurrently through the city. US 70 southwest of Farragut. The highways travel concurrently to Knoxville. US 441 in Knoxville. The highways travel concurrently through the city. US 11E / US 11W / US 70 in Knoxville. US 11E / US 11W / US 19 / US 421 in Bristol. US 11/US 19 travel concurrently to Abingdon. I‑81 / US 58 east of Abingdon. US 11/US 58 travel concurrently for approximately 0.3 miles (0.48 km). US 21 in Wytheville. The highways travel concurrently through the city. I‑77 / I‑81 / US 52 in Wytheville. I-77/US 11/US 52 travel concurrently to Fort Chiswell. I-81/US 11 travel concurrently to south of Pulaski. I‑81 / US 460 in Christiansburg. US 11/US 460 travel concurrently to Salem. US 221 in Roanoke. The highways travel concurrently through the city. I‑81 northeast of Buchanan. The highways travel concurrently to west of Natural Bridge. US 250 in Staunton. The highways travel concurrently through the city. US 17 / US 50 / US 522 in Winchester. The highways travel concurrently through the city. US 15 in Camp Hill. The highways travel concurrently to Shamokin Dam. I‑81 / I‑476 / US 6 in South Abington Township. US 6/US 11 travel concurrently to northwest of Factoryville. ^ Bureau of Public Roads & American Association of State Highway Officials (November 11, 1926). United States System of Highways Adopted for Uniform Marking by the American Association of State Highway Officials (Map). 1:7,000,000. Washington, DC: United States Geological Survey. OCLC 32889555. Archived from the original on November 9, 2013. Retrieved December 6, 2016 – via University of North Texas Libraries. ^ a b "U.S. Route Number Database". American Association of State Highway and Transportation Officials. December 2009. Archived from the original on April 4, 2018. Retrieved December 6, 2016. ^ a b c Google (December 6, 2016). "Overview Map of US 11 in Louisiana" (Map). Google Maps. Google. Retrieved December 6, 2016. ^ Louisiana Department of Transportation and Development Office of Multimodal Planning (February 2012). District 02: Official Control Section Map / Construction and Maintenance (PDF) (Map). Louisiana Department of Transportation and Development. Archived (PDF) from the original on June 30, 2015. Retrieved August 17, 2015. ^ a b Louisiana Department of Transportation and Development Office of Multimodal Planning (February 2012). District 62: Official Control Section Map / Construction and Maintenance (PDF) (Map). Louisiana Department of Transportation and Development. Archived (PDF) from the original on July 6, 2015. Retrieved August 17, 2015. ^ "Department of Historic Resources". This page was last edited on 29 September 2018, at 11:24 (UTC).